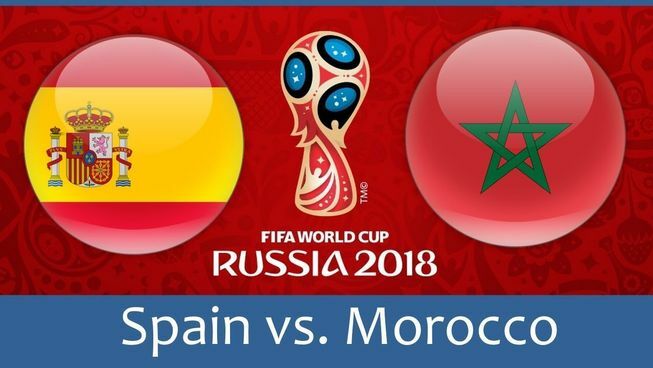 The clash between Spain and Morocco will be played at the Kaliningrad Stadium in Kaliningrad on June 25th. Spain has four points out of the opening two games, and although a draw would get them to the Round of 16, they will try to get all three points and secure a top spot in the group ahead of Portugal. After failing to beat Portugal and red-hot Cristiano Ronaldo who bagged the first hat-trick at this tournament, Spain bounced back against the resilient Iran who defended well for almost the entire game. However, the lucky circumstance and the lack of quality finish from the Iranians propelled the Red Fury to a 1-0 victory as Diego Costa’s flick in the 54th minute was enough for a minimal win. Despite having a ball on their feet and attempting 17 shots, Spain didn’t create a bunch of clear-cut chances, so they must improve if they want to stay in the mix for the World Cup title. On the other hand, Morocco is probably the unluckiest side in the competition as they didn’t even score in the first two games despite being better in both tilts. The Atlas Lions tried to respond to a late defeat to Iran with a better display against Portugal, but Cristiano Ronaldo’s early goal scupper their plans, so once again, the Moroccans were left empty-handed. Diego Costa currently has three goals to his name and a great opportunity to stay in the race for the Golden Boot, so he is the one to watch here as two goals would tie him with Harry Kane at the top scorer list. Hakim Ziyech desperately tried to help his team against Portugal but couldn’t find the back of the net from four attempts, one of which was on target. It seems that he is motivated to show his worth and lift his price ahead of the crazy summer transfer window, and this is a great opportunity for him to finally explode. Spain: De Gea; Carvajal, Pique, Ramos, Alba; Busquets, Iniesta; Silva, Isco, Lucas (Asensio); Costa. Morocco: Munir; Dirar, Benatia, Da Costa, Hakimi; El Ahmadi, Boussoufa; Amrabat, Belhanda, Ziyech; El Kaabi (Boutaib). Spain’s chances to win the World Cup are up to +450, while the Red Fury is -277 to reach the quarter-finals. Morocco will not go out with the white flag and the players will be motivated to display a solid performance against one of the best teams in the world, so instead of backing Spain at miserable -278 odds, I’d go with BTTS as the Atlas Lions will lay without a pressure, which can be dangerous for the Red Fury.